Yay for reading! I had big plans to read today, but so far, no go. I did finish You Will Know Me by Megan Abbott yesterday, though, and that was good. Continued luck with your reading and reviews. Thanks! I hope my luck holds out! I sat down today hoping to read while football was on the Telly but my book had pie in the first line first page and I've spent almost the whole day being distracted by social media bookiness. Future You will be happy! I'm all for making margaritas as part of the readalong and correcting that OBVIOUS mistake. Free margaritas for all readathoners! I don't know either but I guess I'm going to find out! 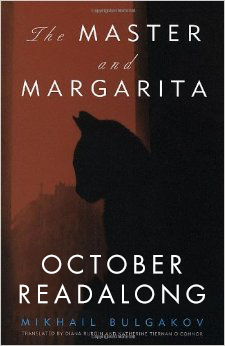 I read the first installment of Master & Margarita today AND scheduled my first post, so I'm feeling incredibly sanguine about this readalong. I anticipate that it will be super great. The readalong, at least. I cannot speak to the quality of the book itself. Look at you! So on top of things! Margarita is a ship? Like the Nina, the Pinta, and the tequila margarita? That could be a song from the 70s. ha! I've been curious about this book. A lot of bloggers name it as their fave read ever. I hope it's good! so far it's pretty weird. Way to go on the reviews! I keep plugging away at writing one a day during the week. I don't think I will ever get caught up, but at least it keeps me in content and prevents the list from getting horribly long and intimidating. Fit in as much as you can on the weekend! How is the job? The job is going okay. My adjusting to this new schedule and trying to keep on top of things is challenging though.